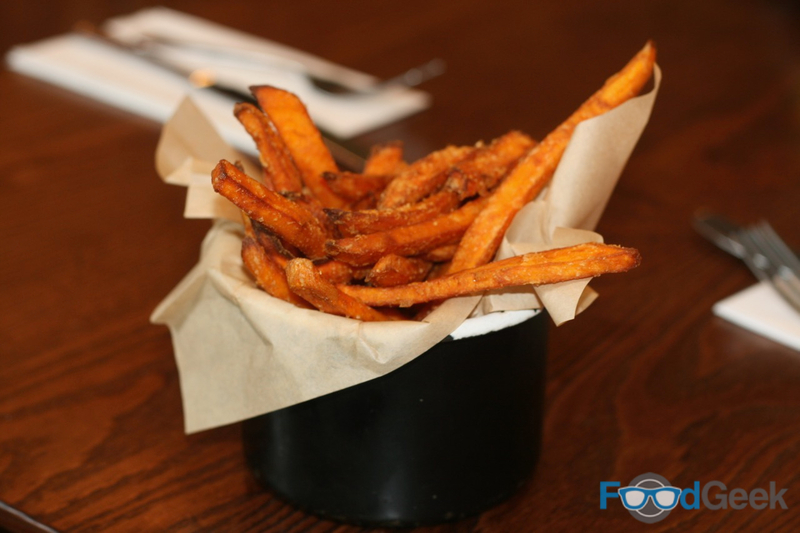 I love pairing food with beer and there are few better combinations than burgers and beer. Byron have always had a reasonable craft beer lineup, particularly compared to most of their competitors but they’ve really upped their game recently. They’ve worked alongside award winning beer blogger & writer Mark Dredge (of whom I’m a big fan) to create a small but well judged craft beer menu. I was invited to check it out. 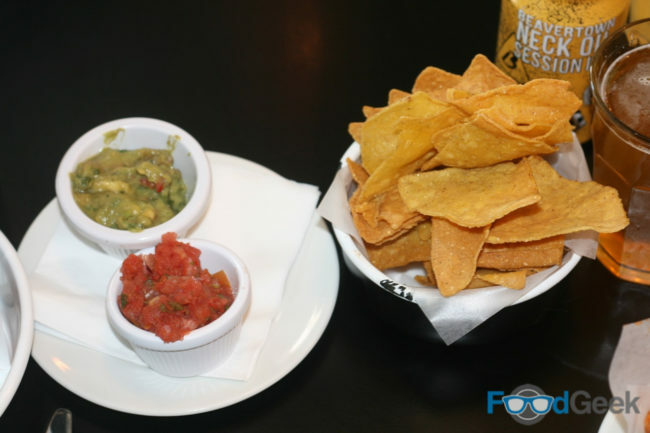 We started with ‘Spicy Buffalo Wings’ and ‘Tortilla Chips’ with salsa and guacamole. I love to tortilla chips and particularly guacamole with a hoppy pale ale or session IPA. You want the fruity, tropical flavours but without the overwhelming bitterness of a regular IPA. 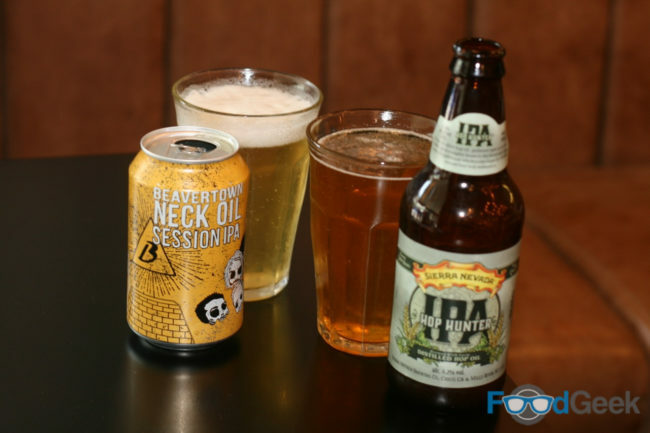 Beavertown’s ‘Neck Oil’ is ideally suited. It’s light and crisp with citrus notes that connect with the lime from the dip. 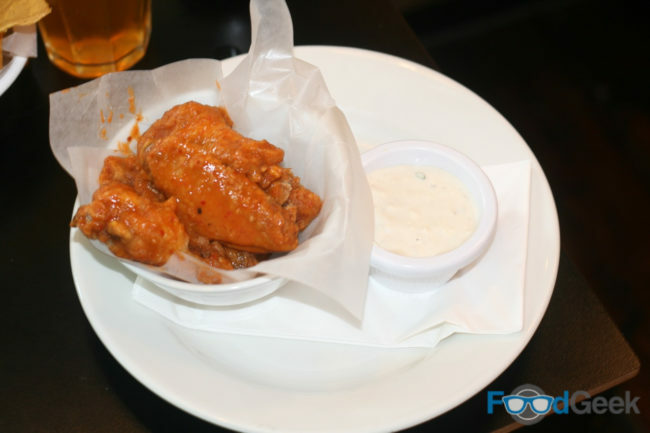 But the Buffalo Wings needed something with a bit more body and booze to stand up to the spice. ‘Hop Hunter’ from Sierra Nevada was perfect. A stronger and more complex IPA that holds its own against the fiery wings and blue cheese dip. While the additional bitterness cuts through the richness nicely. When it came to ordering burgers I was torn. I loved the sound of the current special, the Korean inspired ‘Kimcheese’ but I’m a big fan of their ‘Smoky’. Eventually I opted for the latter. 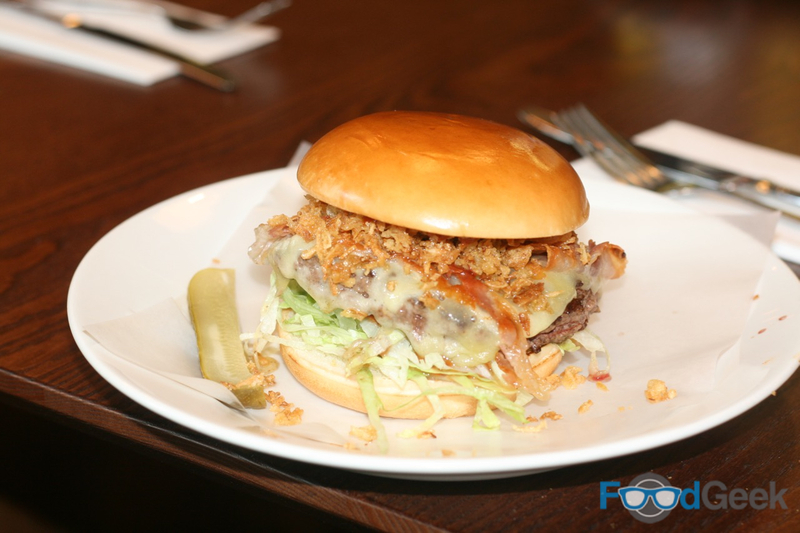 Essentially a classic burger, with typical ingredients cheddar, pickles, streaky bacon, lettuce and onions. But the twist is the smoked chilli BBQ sauce. It gives a great smoky flavour and nice chilli kick. Besides the sauce, the best bit were the crispy fried onions. 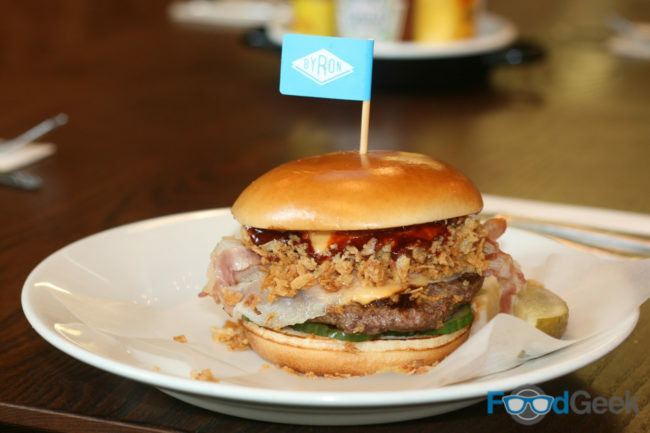 Along with the crisp bacon and shredded iceberg they add a welcome crunch amongst the tender meat patty and squishy bun. Luckily for me, Mrs Food Geek went for the ‘Kimcheese’ so I got to try it anyway. The Korean inspired burger is topped with some of my favourite East Asian ingredients. A smoky umami rich Korean BBQ glaze, tangy kimchi cucumbers, gochuchang (fermented red chilli) sauce and ssamjang mayonnaise. Its everything I love about Korean food – in a bun. 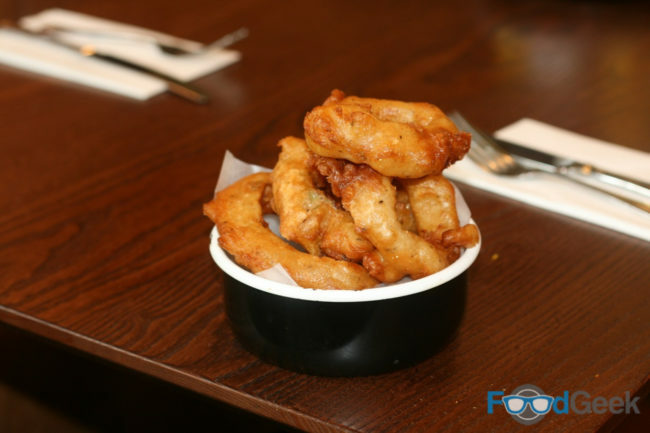 Spicy, sweet and savoury in equal measure. With typical East Asian flavours of garlic, chilli and ginger coming through. Again the crispy onions give a real contrast of texture from the soft bun. There’s no better beer to pair with a burger than an IPA. Fruity hops match the sweet sauce, the malt backbone combines with the char of the meat while the bitterness cuts right through the fat. They’re a match made in heaven! There are several IPAs on the menu at Byron that would have worked well. I opted for BrewDog’s ‘Elvis Juice’ to go with my ‘Smoky’ burger. The grapefruit infused IPA has all the characteristics that makes burger and IPA a great pairing. Plus a ton of additional citrus flavour, which balanced the sweetness of the sauce wonderfully. With the ‘Kimcheese’ I went for Beavertown’s ‘8 Ball’ a rye IPA. The sweet malts and spicy rye are a perfect match for the savoury umami heavy burger. I really enjoyed my burgers at Byron, as I always do. And it was great to be able to choose genuinely good beers from a very decent selection to pair with them. There are more beers available in cans and bottles from the likes of Moor and Vocation. While smaller (but brilliant) regional breweries such as Marble, Magic Rock and Redchurch will be available on draft in certain Byron branches! I’m looking forward to returning and trying some other combinations of proper hamburgers and proper craft beers. Disclaimer: I was invited by Byron to sample their new craft beer menu. As ever this does not guarantee a positive review. I have been happily paid for both Byron burgers and all of these beers before and no doubt will again in future. It’s True! 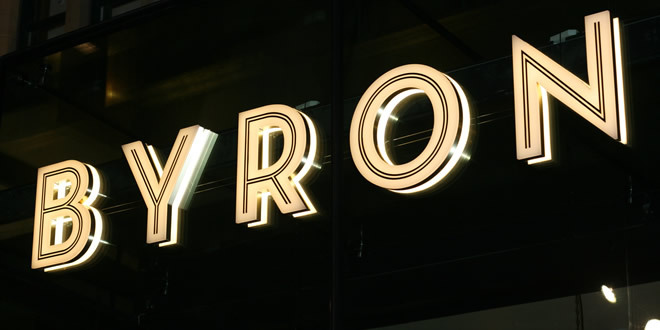 Byron Are Bringing ‘Proper Hamburgers’ To Manchester! 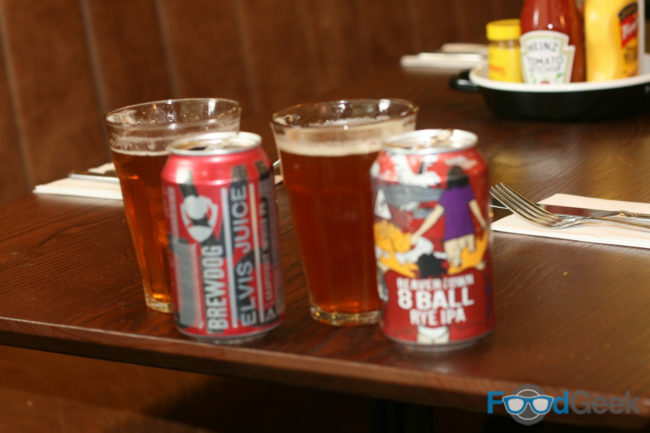 Interesting pairings Shaun.Burgers look and sound great,you make strong points for picking the beers you chose.